Okay so today this is going to be quite a personal post – I’m going to talk to you guys about something called sleep paralysis. It is described as ‘a temporary inability to move or speak that happens when you are waking up or, less commonly, falling asleep.’ and that is exactly it. For those of you who haven’t experienced or heard about it I would describe it to you as limbo – imagine you’re still asleep but very aware of what’s going on in your dreams and these are not usually the best dreams to be stuck in! It’s only happened to me a handful of times, so it is a very rare occurrence thank goodness, but after dosing off this afternoon it happened again. Although sleep paralysis isn’t harmful in any way, you don’t become physically paralysed forever or anything like that, it is really scary. I didn’t even realise it was a condition ’til I talked to my boyfriend about it a while ago and he told me his mum had it too, I thought I just had a weird brain! 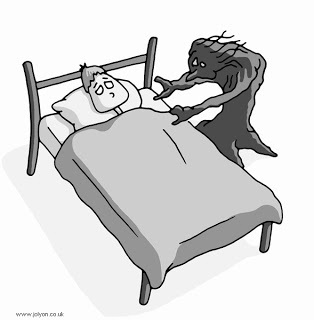 When it happens to me it seems to be dreams where someones trying to hurt me (or on this occasion an intruder in my house) and just like you would want to if this was real – you are desperately trying to escape from the situation which is what makes it 10x worse when you realise you can’t wake up. You are trapped in this nightmare and no one can help you. Even though in the back of your mind you know it isn’t real part of you is still asleep and still dreaming and making all these things happen and blurring the lines of reality and imagination. You try to scream – you can’t. You try to get out of bed – you can’t. You tell yourself it’s just a dream but the panic is still there you just want to get out and wake up. When you eventually wake up it’s such a relief, but you become scared of yourself and what your mind is capable of and then the next hurdle is trusting yourself to sleep again without something bad happening. What about you guys? Have you ever experience this or do you have any questions? Let me know!